Kick off your visit on the 5th (Mon): explore the galleries of Jim Thompson House, contemplate the waterfront views at Khlong Saen Saep, and then head off the coast to Koh Kred. For maps, traveler tips, ratings, and other tourist information, read our Bangkok itinerary planner. Johannesburg, South Africa to Bangkok is an approximately 15.5-hour flight. The time zone changes from South Africa Standard Time (SAST) to Indochina Time (ICT), which is usually a 5 hour difference. Traveling from Johannesburg in June, things will get much warmer in Bangkok: highs are around 39°C and lows about 30°C. Finish your sightseeing early on the 6th (Tue) to allow enough time to travel to Chiang Mai. Head to Mesimu and G.G Armani collectionfor plenty of shopping. Your inner history buff will appreciate Wat Chedi Luang Worawihan and Wat Phra That Doi Kham (Temple of the Golden Mountain). Change things up with these side-trips from Chiang Mai: Elephant PooPooPaper Park (in Mae Rim) and Wat Phra That Doi Suthep (in Doi Suthep). On the 8th (Thu), spend an adventurous day with a kayaking and canoeing tour. There's still lots to do: buy something for everyone on your list at Kad Luang - Warorot Market, look for gifts at Supreme Collection, and delve into the distant past at Wat Umong. 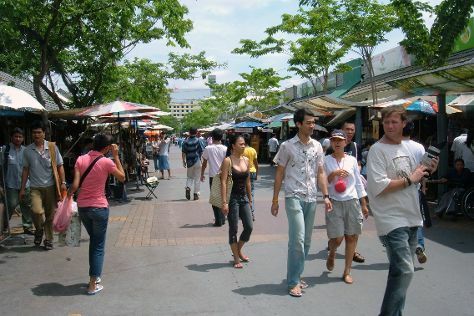 To see more things to do, where to stay, other places to visit, and tourist information, read Chiang Mai trip planner. You can do a combination of train and flight from Bangkok to Chiang Mai in 3 hours. Alternatively, you can drive; or take a bus. Expect a daytime high around 39°C in June, and nighttime lows around 28°C. Wrap up your sightseeing on the 9th (Fri) early enough to travel to Kanchanaburi. The capital city of an eponymous province, Kanchanaburi is a pleasant town with lively markets and a good selection of restaurants. Bridge Over the River Kwai has been added to your itinerary. 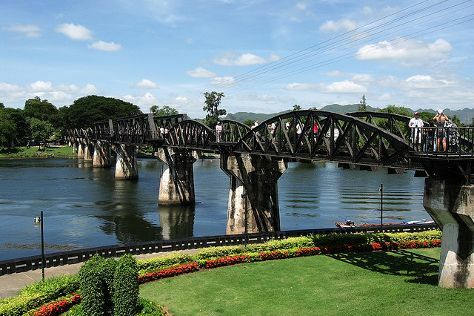 Start off your visit on the 9th (Fri): stroll the grounds of Kanchanaburi War Cemetery, contemplate the waterfront views at River Kwai, then see the interesting displays at Bridge Over the River Kwai, and finally zoom along the surf with a waterskiing or jet-skiing adventure. To see other places to visit, maps, and more tourist information, use the Kanchanaburi trip builder. Traveling by combination of flight and train from Chiang Mai to Kanchanaburi takes 7.5 hours. Alternatively, you can drive; or do a combination of bus and taxi. You will have some time to spend on the 10th (Sat) before leaving for Bangkok. Do your shopping at Chatuchak Weekend Market and Rajawongse Clothier. Visiting Dong Phayayen-Khao Yai Forest Complex and Klongs will get you outdoors. Explore the numerous day-trip ideas around Bangkok: Ayutthaya (Wat Yai Chai Mang Khon, Chao Phraya River, & more) and Amphawa Floating Market (in Amphawa). Explore Bangkok further: step into the grandiose world of The Grand Palace, contemplate in the serene atmosphere at Temple of the Emerald Buddha (Wat Phra Kaew), admire the striking features of Jim Thompson House, and stop by Raja's Fashions. To find maps, photos, traveler tips, and other tourist information, read Bangkok tour planner. Drive from Kanchanaburi to Bangkok in 2 hours. Alternatively, you can take a train. You'll have a few hours on the 19th (Mon) to wrap things up before traveling to Pattaya. Discover out-of-the-way places like Central Festival Pattaya Beach and Big Buddha. Get outdoors at Ko Samae San and Toei Ngam Beach. Change things up with these side-trips from Pattaya: Sattahip (Sai Kaew Beach & Buddha Mountain (Khao Chi Chan)). Spend the 20th (Tue) among aquatic life with a scuba or snorkeling tour. There's still lots to do: stop by Jack and Dave, buy something for everyone on your list at Royal Garden Plaza, admire the striking features of Sanctuary of Truth (Prasat Sut Ja-Tum), and get your game on at Easykart Pattaya. To find more things to do, reviews, photos, and other tourist information, read our Pattaya tour planner. You can drive from Bangkok to Pattaya in 2 hours. Other options are to take a bus; or take a train. In June, daily temperatures in Pattaya can reach 37°C, while at night they dip to 30°C. Cap off your sightseeing on the 24th (Sat) early enough to travel to Krabi Town. Your day-by-day itinerary now includes Emerald Pool (Sa Morakot) as well as Tup Island. Escape the urban bustle at Railay Beach and Khlong Muang Beach. Discover out-of-the-way places like PhraNang Cave Beach and Tiger Cave Temple (Wat Tham Suea). Next up on the itinerary: stop by Alex Fashion Way and have fun at Holiday Inn Krabi Kid's Club. For where to stay, more things to do, traveler tips, and tourist information, use the Krabi Town travel itinerary planner. Traveling by combination of train, flight, and taxi from Pattaya to Krabi Town takes 6 hours. Alternatively, you can drive; or take a bus. 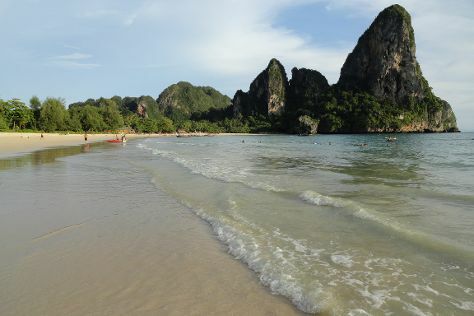 In June, daily temperatures in Krabi Town can reach 37°C, while at night they dip to 28°C. Finish your sightseeing early on the 27th (Tue) so you can travel to Bangkok. To see traveler tips, other places to visit, ratings, and more tourist information, go to the Bangkok travel itinerary planner. Do a combination of bus, flight, and train from Krabi Town to Bangkok in 4.5 hours. Alternatively, you can drive; or take a bus. Finish up your sightseeing early on the 27th (Tue) so you can travel back home.